I'm calling all this pareidolia. Its just the brain trying to create something familiar out of unfamiliar patterns. This photo that I took of my dog was in Aug. The wood stove was NOT GOING. Nobody smokes in the home. I believe there is an animal spirit in this photo and to me the eyes (in the middle of my dogs face) look like cat eyes to me? or at least I HOPE its a cat, and not anything bad.
" Its just the brain trying to create something familiar out of unfamiliar patterns." Right.... because these two " patterns " depicted inside the red area appear in all the rest of the photos I can see where I might mistake the pattern of a skull for a bird flying by? or maybe a skunk? I'm curious, just what you might think the "patterns" might be, that are changing for over an hours time? I told what they 'might' be. Do you want me to tell you that you've got demons? Do you want it to be paranormal? You know what? I don't even care anymore. Good luck. "Have you attempted to cleanse your home by Chance? Or even the area around it? You could smudge the home with sage"
I have not attempted any cleansing or smudging. I would definitely need to read up on the how to's on these, because I have no idea. Very curious for feedback on these. I looked at these and found them suspicious but vague, which would also make sense with paranormal activity too. With all the different things you have experienced, I suspect you may be in a paranormal energy hot spot where more than the normal is likely to occur. Nothing seems negative though. It is your decision to cleanse or just be comfortable with it all. The one with the dog is obviously a double exposure- the whole picture is shaky and doubled. The playground ones don't look like anything but a couple black dots, but you're shooting through a window screen so it could be any matter of debris shifting in the breeze. It would be interesting to know how long after the pics were taken with the kids and the playground did you notice this stuff. This is all motion blur. What you think are eyes is actually his nose. He moved his head and you moved the camera. I thought that too about the dog one, but if you look at where the dogs leg is, it’s very clear. Have you attempted to cleanse your home by Chance? It’s motion blur. The camera (and possibly the dog) moved. The toy next to the dogs leg is out of focus, the wood floor is out of focus, the shirt (or is it a stuffed animal?) on the floor is out of focus, the animal print on the rug is out of focus and the paw further away from the toy has some blur by the toes. To be honest. The thing on the tree looks as if it was painted there. Like an old Halloween decoration, but that's just me. "If you take a photo through a glass/window its called re-reflection"
The photo was not taken through a glass window?!?! a screen yes. 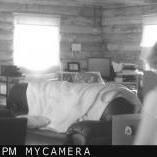 I stated that the camera was IN BETWEEN the window and the screen on the second floor, facing the front yard to monitor who was at my home while I wasnt. I'm appalled that you are accusing me of posting a hoax. Maybe you should go back and read my very first post. This is not a game to me, (maybe for you it is) I have better things to do with my time other than joining a forum to post BS hoaxes. If your such a skeptic why are you even a member here???????? That is all. Can you please explain what exactly do you see/hear/feel outside the house? As you only have problems with that one. "What you think are eyes is actually his nose"
And let me guess, ....... the sections that look like there is a smoke cloud, must be a lens flare from my living room lamp? I can see the double exposed nose. the eyes are above that. Ok folks... I know a lot of you have your own takes on spooky stuff... but the OP is getting too much flack in this thread. It's not hospitable to the new member and not within keeping of the forum rules. Be nice folks, and discuss the topic civilly please.